Well, winter has arrived in Vancouver in a big way. In the 5 years I’ve lived here, I’ve never seen this much snow. Having grown up in Ottawa, Ontario, Canada, I’m pretty used to freezing temperatures and tons of snow, but hey…this is Vancouver! What’s all this white stuff? You’re supposed to be able golf in Vancouver on Xmas Day! Oh well…on goes the fire and I’m busy wrapping up the last of the gifts this year. One thing I always have trouble with is buying for my girlfriends who golf. But not this year. Lucky for me I discovered a gift that I would want myself – in fact…I found two! The first is from our good friend Charlotte Campbell from Highway 18. Anyone who knows Charlotte knows she’s a wizard at creating beautiful ball markers, AKA Blingos! 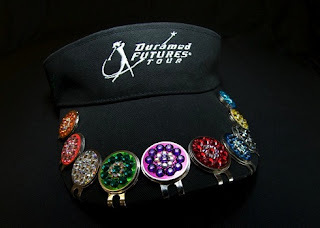 She makes the Swarovski ballmarks to help pay for her golfing on the Duramed Tour. I bought a bunch from her this fall and they are just gorgeous (I want to keep them all for myself and buy outfits to match – LOL!). They look more like jewelry than something you’d put on the ground. Hey…maybe they’ll help my putting! They go great with my Gemspot putter. A gift for your golfgal or golf GF, at only $15 each, they are steal. To go along with the blingos, I also lucked out when I heard about another terrific gift for the lady golfer and it’s not only beautiful and useful, it serves a higher purpose. 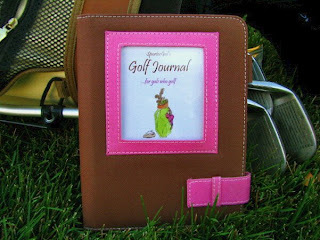 A SporteeGal Golf Journal is the perfect gift for a woman who is serious about tracking her golf games or just wants to keep momentos of fun golf moments with friends. And once again…the price is right. They usually sell for $26.95, but this month, they are on sale for $21.95. And what’s even better…a $1 from the sale of each journal is donated to Newborns in Need. Pretty cool, eh? Once again, I bought some for friends and kept one for myself ;). Oh…by the way, she even gift wraps them for you – now THAT I appreciate at this very busy time of year. I realize it’s getting pretty late to buy these in time for Xmas, but hey, Valentine’s Day is just around the corner and don’t forget birthdays come every year whether we want them or not! Have a very Merry Christmas everyone and I wish you a 5 point drop in your handicap in the new year!